As the fall migration started last week in the southeast, one of my goals is to see if I would be luckily enough to photograph this Golden-winged Warbler (GWWA). Few of my good birding friends joined me this morning and birded around Cochran Shoals Unit (a must visit birding hot spot) of Chattahoochee National Recreational Area, regretfully, after walking almost 4 miles, we did not have any luck. Instead, we spotted this rare bird, Olive-sided Flycatcher (Contopus cooperi), my lifer of the day! Hooray!!! 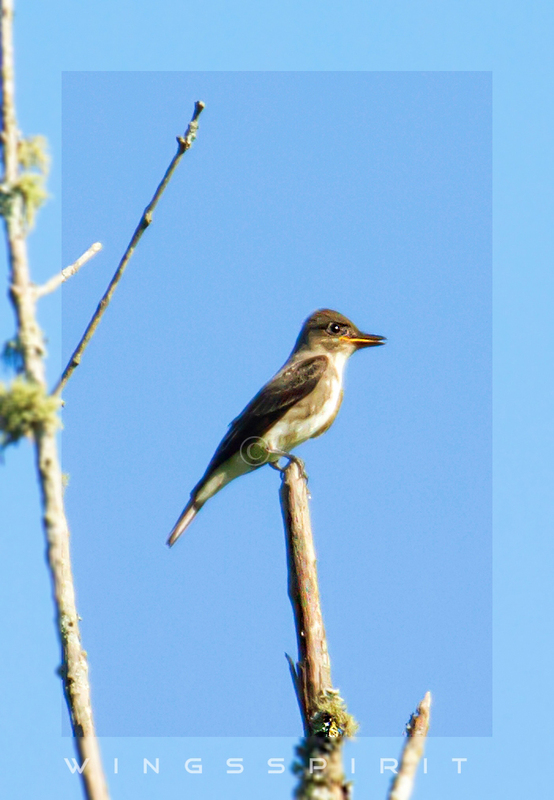 When Mark McShane spotted Oilve-sided Flycatcher via his scope (GPS location this morning: N 33 54.727 W 84 26.995), I was "wow, wow, wow" without knowing how rare this bird really was. Mark winked at me and said "Linda, do you know how rare this bird is?" I had no clue and later I learnt that if we are lucky, this bird is sighted only 1 to 3 times a year and its migration route is normally restricted to the west of Texas. I wanted to snap this bird so badly but Mark then suggested to go to the back of the "sparrow field" to get a closer look at this bird. I was not too happy because I thought this bird might fly off by the time we get there. But what can I say, not only did this bird stay safe and sound on the same branch as Mark predicted, he "dropped" down and dived towards ground to catch his prey consistently! Mark, you are the best! Seven or eight of us all had a great look at this cool flycatcher and no doubt, I snapped many photos of this rare visitor under a great light! So, why I called this post "Quick 3 beers"? You will all agree with me that this bird looks sober, right? My good friend, the queen of birding by ear, Iris Schumacher, reminded me how this cool bird sounds like (click link to hear the calls) :) Now you know why! Final note: Olive-sided Flycatcher is near threatened (not endangered but number has seriously reduced) due to the lost of snags, tall trees and forest edge at their wintering ground..... - Linda. Congratulations on a rare find Linda. Thanks Trevor ;) ..Got another lifer today, Gosh! I love fall!